Completed by Dubai-based fit-out company New Evolution, this Hattan villa is MAJOR goals. 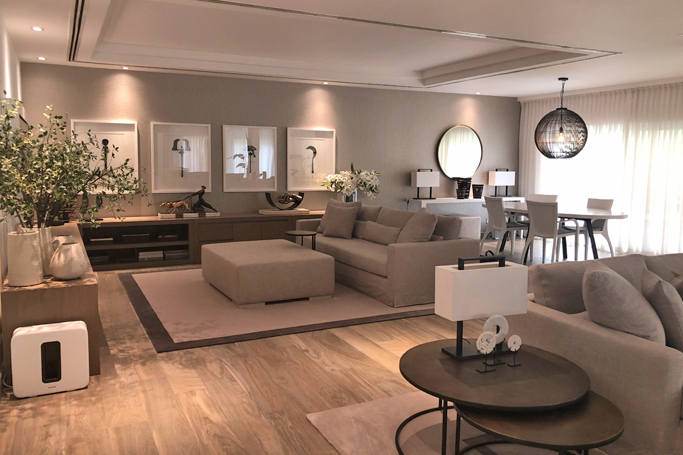 Everything from the plot extension, to the landscaping, and the customised furniture – basically the entire refurbishment – was completed by the company, who provide a high-end, quality service based on 12 years of experience in Dubai, and over 20 years’ experience in the UK. This Hattan villa project, in the Emirates Living development, is one of more than 850 design projects in New Evolution’s portfolio. Every single project is unique, and completely personalised to the client. And when it comes to Dubai’s standards of interior design, New Evolution are leading the way as this incredible Hattan villa is dreamy. Everything from the furniture throughout the house, to the niches in the walls, porcelain tiles with a wood effect, and the textured wallpaper... This monochromatic home oozes sophistication. Its sleek design is perfected throughout the lounge, kitchen, bathroom and master bedroom, and stretches outside also. There's an infinity pool and bi-folding doors that help expand the living room straight into the garden, giving more space to the house. There is two kitchens in this stunning Emirates Living villa - a work kitchen, and a social kitchen. Both are separated from each other, and there's also a maids room attached. Added details like niches in the bathroom walls help to add luxury to the villa's bathrooms.